This native perennial (sometimes biennial) deserves a place in any sunny landscape. 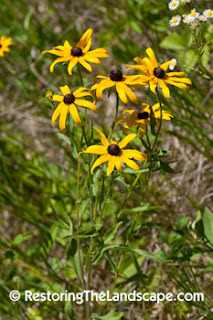 A very versatile plant, it will grow in dry to wet soils in prairies, roadsides and woodland edges. 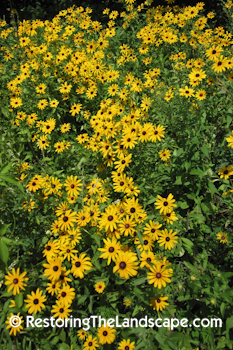 The bright yellow-orange flowers open in late June, continuing to flower and often rebloom into the fall months. The dark brown central disk iscomprised of many florets and is surrounded by 8-21 yellow-orange rays. The whole flower is two - three inches in width making it extremely showy. The leaves are very coarse to the touch as they are covered with hairs, along with the flower stalk and flower bracts. 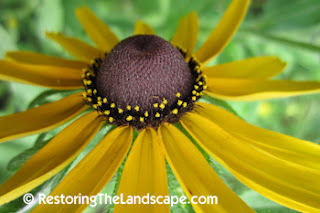 In our landscape, Black-Eyed Susans are short-lived but they do readily reseed themselves so we always have some. If you plan to add this native to your landscape, it works well to buy seed because Black-Eyed Susans will often flower the same year as seed is sown. 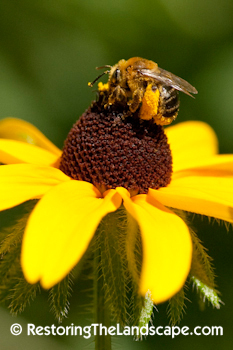 Native bees like this female Long Horned Bee will visit the flower for pollen, along with smaller Sweat Bees. 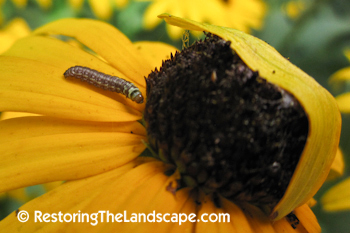 Insect larvae will feed on the central cone and bore holes in it. Several of the flowers in our landscape will have a single ray floret folded over the top of the cone to create a protected feeding area. 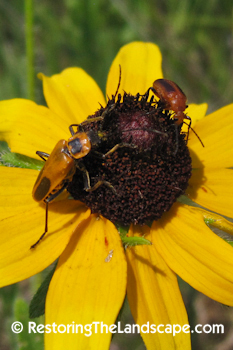 Beetles will also visit the flowers, a Soldier Beetle and Blister Beetle pictured here. Read more about this Blister Beetle's lifecycle here. Black-Eyed Susans are native to central and eastern North America. See map for range.